At the hospital in Korogwe, Tanzania, mothers are waiting in line with their young children to have the children tested for malaria. 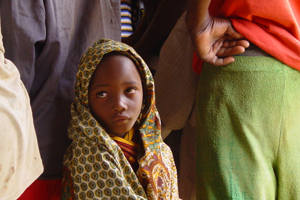 The aggressive parasite kills one million people each year of which the majority is children below the age of five. Photo: University of Copenhagen. Researchers have identified how malaria parasites growing inside red blood cells stick to the sides of blood vessels in severe cases of malaria. The discovery may advance the development of vaccines or drugs to combat severe malaria by stopping the parasites attaching to blood vessels. The results are now published in the scientific journal Nature. Though researchers have known for over a century that red blood cells infected with malaria parasites can kill their host by sticking to the sides of blood vessels, the binding mechanism associated with the most lethal forms of malaria was unknown. Now, in a study published in Nature, the researchers show that the parasite binds a protein in blood vessel walls called endothelial protein C receptor (EPCR), which is involved with regulating blood coagulation and the inflammatory response. Malaria parasites grow in red blood cells and stick to the endothelial lining of blood vessels through a large family of parasite proteins called PfEMP1. This way, the parasite avoids being carried with the blood to the spleen, where it would otherwise be destroyed. One of the most aggressive forms of malaria parasite binds in brain blood vessels, causing a disease called cerebral malaria. In 2012, three groups of researchers, including the teams at the University of Copenhagen and Seattle Biomedical Research Institute, showed that a specific type of PfEMP1 protein was responsible for cerebral binding and other severe forms of malaria infection. However, until now, the receptor to which it binds remained unknown, and the next big question was to determine which receptors the infected red blood cells were binding to. “The first big challenge was to generate a full-length PfEMP1 protein in the laboratory,” says Assistant Professor Louise Turnerat the University of Copenhagen. “Next, we utilized a new technology developed by Retrogenix LTD in the United Kingdom to examine which of over 2,500 human proteins this PfEMP1 protein could bind to.” Of the 2,500 proteins screened, a receptor called endothelial protein C (EPCR) was the single solid hit. 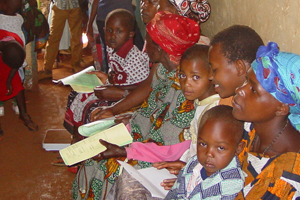 “A lot of work then went into confirm this binding in the lab and not least to show that parasites from non-immune children with severe malaria symptoms in Tanzania often bound EPCR,” she continues. 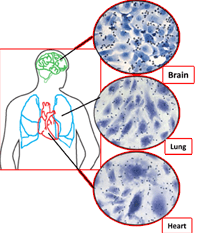 Red blood cells infected with Plasmodium falciparum malaria bind to the endothelial lining of blood vessels in vital organs, such as brain, lung, and heart leading to disease complications with a high risk of deadly consequences. Image ourtesy of Seattle Biomed[/caption]Severe malaria symptoms such as cerebral malaria often result in minor blood clots in the brain. One of our body´s responses to malaria infection is to produce inflammatory cytokines, but too much inflammation is dangerous, describes Professor Joseph Smith, from the Seattle Biomedical Research Institute. “ECPR and a factor in the blood called protein C act as a ‘brake’ on blood coagulation and endothelial cell inflammation and also enhance the viability and integrity of blood vessels, but when the malaria parasites use PfEMP1 to bind EPCR, they may interfere with the normal function of EPCR, and thus the binding can be the catalyst for the violent reaction,” he explains. Children who have suffered from severe malaria can experience poor hearing and reduced learning capacities later in life. Photo: University of Copenhagen. Vaccine research will also benefit immediately from the discovery, since scientists can already now test the effectiveness of different vaccine candidates at preventing PfEMP1 from binding ECPR. “Over the last decade, we have come to appreciate that specific PfEMP1 proteins are associated with different severe forms of malaria,” explains Professor Thor Theander at the University of Copenhagen. “Together with The National Institute for Medical Research Tanzania, we are in the process of preparing phase I trials for a vaccine to prevent parasite binding in the placenta and malaria during pregnancy,” he explains. This new discovery holds the potential for also developing a vaccine to reduce the heavy burden malaria disease inflicts on children. “It will be a long haul, but with these results, we can get started right away,” he says.